This is one of our favorite weeknight recipes — super fast and absolutely delicious. We’re trying to introduce more fish into our diets, but this is sometimes a challenge because Kelly does not like most fish dishes. 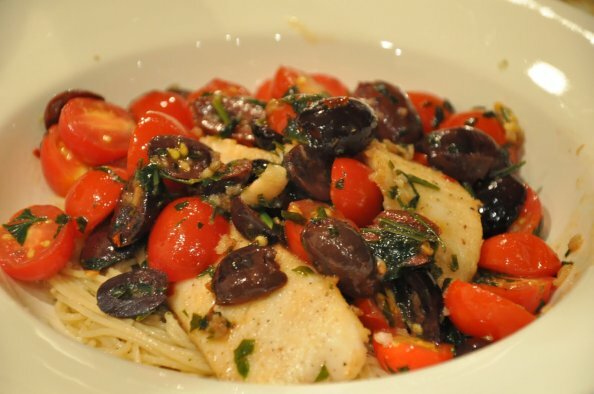 But Kelly is a huge fan of both tomatoes and olives, and the tilapia in this recipe is light and mild. On this particular night, we even used some of our own tomatoes from our garden. 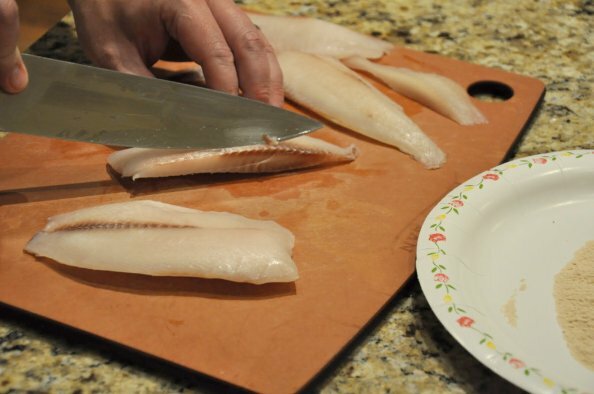 After thawing the frozen fish, rinse and pat it dry with paper towels. Drying it helps to reduce oil splatter and allows the fish to get a bit of a crispy brown crust when it is lightly dusted with flour. 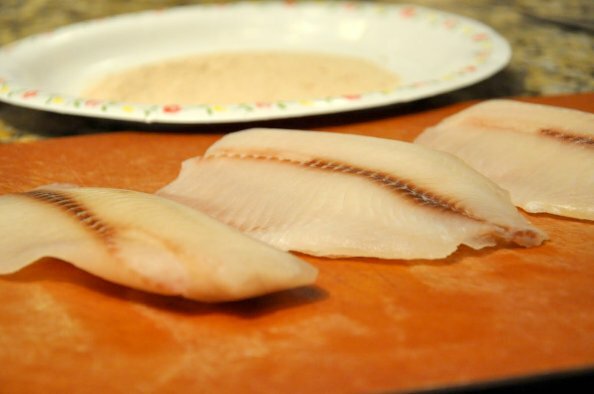 Kelly does not like “fishy” fish, so we cut the tilapia in half and remove the dark brown strip from the middle of the fish, which (allegedly) cuts down the fishy taste. 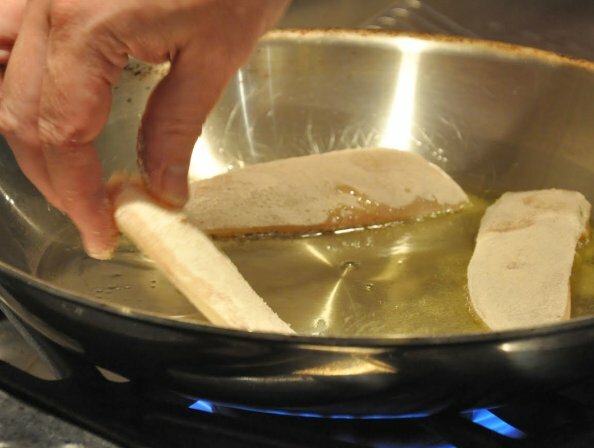 CAREFULLY add the fish to the hot olive oil, slowly to avoid splashing the hot oil. You may also consider using tongs instead of your fingers. (Dan inexplicably ignores this advice, even after getting second degree burns on his face and lips in a hot oil incident that is the subject/recipe for another time). The skinny spatula is a very handy kitchen tool. Use it to turn the fish. After browning the fish, remove it to a plate and set aside. 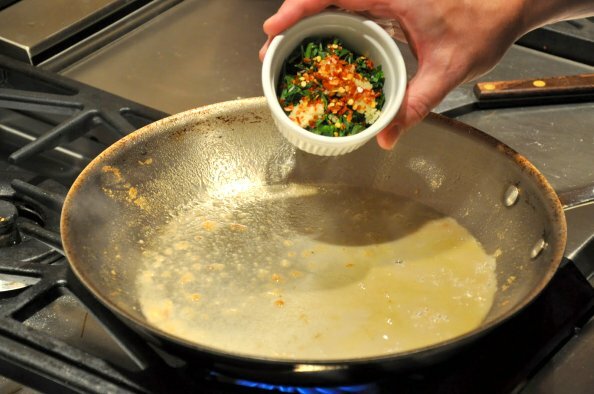 In the empty skillet, add white wine to deglaze the pan. When it has reduced by half, add the parsley, garlic and crushed red pepper. Then add the tomatoes and olives. After a minute (not much longer or the tomatoes will get mushy), bring back the fish. The easiest way to do this is push the tomato/olive mixture to one side, then add several pieces of fish. Do the same on the other side of the skillet. On this night, we served the fish over a very simple garlic olive oil pasta. We boiled the pasta (thin spaghetti), drained it, and stirred in some good olive oil, a few sprinkles of granulated garlic, and salt and pepper to taste. You can find good quality frozen tilapia at the grocery store. 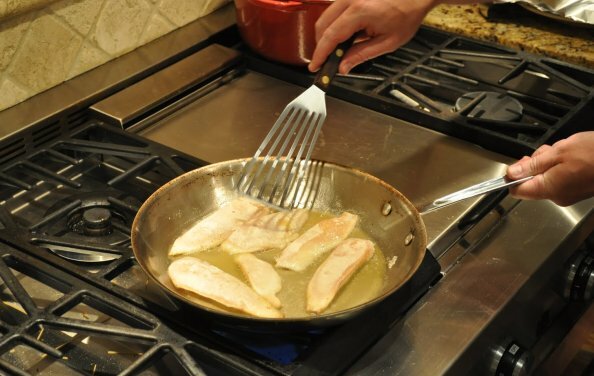 To thaw immediately before cooking, put the pre-packaged fillets in the sink, rinse with cold water for a few seconds, and allow to sit in the sink for about 5-10 minutes until thawed. Remove the fish from the plastic packaging and pat dry with paper towels. Salt and pepper both sides of the fish, and dredge the fish in flour, shaking to remove any excess flour. Heat a large skillet over medium high heat. Add olive oil. Saute the fish until lightly browned on both sides, turning the fish once, about 6 minutes total. Remove the fish to a plate. Add the wine to deglaze the pan, and cook until the wine is reduced by half, stirring with a spatula occasionally. Add the garlic to the now empty skillet, and sauté for a minute. Add the parsley and crushed red pepper, stir with the garlic. 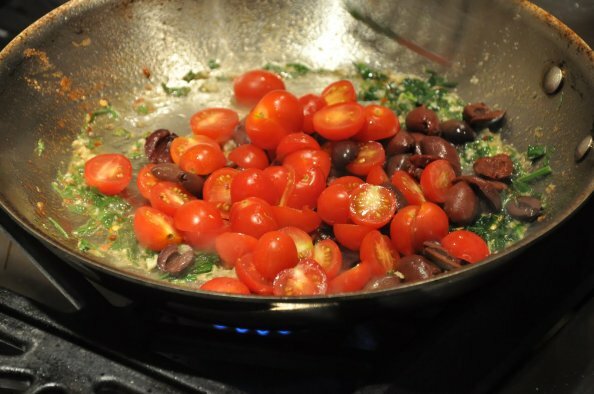 Add the tomatoes and olives, stir to combine all of the ingredients in the skillet, and cook one minute. 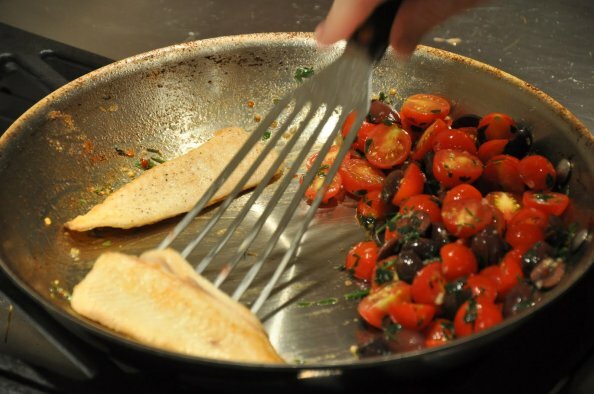 Add the fish back to the pan, pushing the tomato and olives aside and then on top of the fish so that the fish is on the bottom of the skillet. Cook until the fish is reheated and the tomatoes are beginning to soften, about 3 minutes more. Thank you for creating this recipe! My wonderful husband (of 7 yrs today) made this for our anniversary dinner. He included some scallops to make it extra special and served it with broccolini and a yummy salad with gorgonzola cheese. 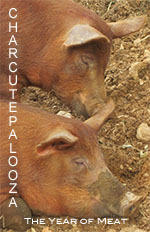 We love you, FoodieLawyer, and can’t wait to try out all of your amazing dishes! Thanks Cary! We are so glad that you love the fish dish (it is my favorite too), and we are honored that you had it for your special occasion! Happy Anniversary!